Attempting to reduce overdose risk by depriving patients of painkillers raises the odds of suicide and is both cruel and senseless. Important piece by ⁦@maiasz⁩ on why reducing #opioid prescribing alone will not solve the #overdose crisis but can cause very real harms including rising fentanyl & heroin related deaths in context of unsafe drug supply & suicide. In an effort to reduce opioid addiction, doctors are cutting back on pain pill prescriptions. But many patients with chronic pain are suffering and in some cases suicidal as a result. 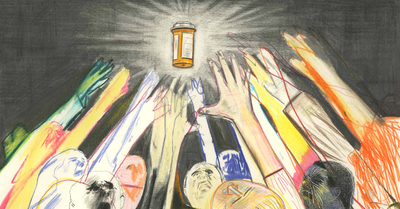 @crulge patients on long-term opioid therapy are furious, and desperately trying to organize; many are being abandoned by their docs and losing access to care. Opioid addiction is bad. So is pain. It's important to find a balance, rather than subjecting patients to agony that could be avoided. @choo_ek @gillibrandny @SenCoryGardner Impt to look at real root causes— despair, trauma, dislocation & companies taking advantage of lax regulations. 80% of ppl who misuse opioid prescriptions got them from friends & family, not drs— and most pain pts aren't addicted. When the Cure Is Worse Than the Disease: In an effort to reduce opioid addiction, doctors are cutting back on pain medication — and sometimes leaving patients to suffer. Since the early '90s @maiasz has been one of the smartest, important voices in America about addiction, narcotics, #HIV and now #opioids . Her latest piece is a must-read.